No background or training in music? No problem. 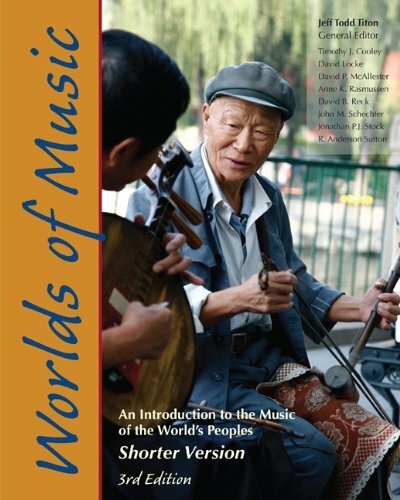 This shorter version of WORLDS OF MUSIC: AN INTRODUCTION TO THE MUSIC OF THE WORLD'S PEOPLES is written to make music accessible. Using the case-study approach, the text presents in-depth explorations of music of several cultures from around the world. The authors all ethnomusicologists working in their fields of expertise base their discussions of music-cultures on their own fieldwork and give you a true sense of both the music and culture that created it. The supplementary 3 CD set works hand in hand with the authors' prose providing students with access to a wide range of music-cultures and include authentic recordings from the authors' fieldwork. Leading off is the long-standing jewel in the Worlds of Music crown - James Koetting's magnificent recording of postal workers canceling stamps at the University of Ghana post office. A Western-sounding hymn tune performed against African rhythms, this piece, more that any other, lets you hear contrasting music-cultures. View More In Arts & Photography.